What is it that separates a special meal from all the rest? A meal you savor while eating and you feel good about sharing with family and recommending to friends? Sometimes, it’s the little things–like the pickles we hand make for all our bentos! 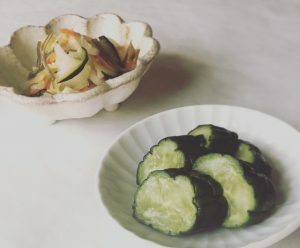 Whether it’s pickled cucumbers, pickled cabbage, or a mix of pickled veggies, pickles are a standard item that helps make bento a unique and fabulous choice. Kyuri karashizuke (Persian cucumber pickled in Japanese mustard) are our hometown Akita’s recipe. Hakusai asazuke (Napa cabbage quick pickles) with carrot, cucumber and shredded kombu, is simple and refreshing with a citrus twist. No MSG, of course, because kombu provides loads of umami! We never compromise on the quality of our meals, and our pickles are a perfect example of our philosophy at work. They’re not only tastier, they’re much healthier, too! « Bento is Back: Hiyashi Chuka for Summer! Traditional recipes made from scratch and offered in a variety of premium bento boxes. Enjoy lunch delivery or dinner pick-up at select locations in downtown Seattle. Join our cooking classes at PCC and Chef Shop. Let us cater your next event. And have us to your home or office for parties, classes and private chef services everyone will love. Come home to Kozmo Kitchen! I am a Japanese native following her dream of bringing Japanese home cooking to Seattle. I love sharing the culinary traditions I grew up with. Making people happy through great food and dining experiences. And creating that feeling of family and home that only a nurturing hand crafted meal can provide. I see a world where everyone can make Japanese home cooking a part of everyday life that brings warmth, comfort and joy. Please allow me to share it with you. Bento is Back: Hiyashi Chuka for Summer! We Love Making Customers Happy!